Justice Pradeep Nandrajog takes oath as New Chief Justice of Rajasthan High Court on 2nd April 2017 in a ceremony at Raj Bhawan, Jaipur. Governor Kalyan Singh administered the oath of office to Nandrajog. The Chief Justice took the oath in English in the presence of Rajasthan Assembly Speaker Kailash Meghwal, Chief Minister Vasundhara Raje and members of the council of ministers. Nandrajog was the Delhi High Court judge before being appointed as the Chief Justice of Rajasthan High Court. 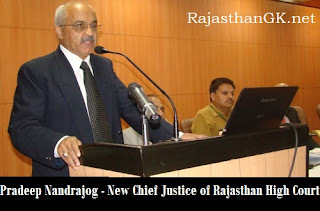 Earlier President in exercise of the powers conferred by clause (1) of Article 217 of the Constitution of India appointed Justice Pradeep Nandrajog, Judge of the Delhi High Court, to be the Chief Justice of the Rajasthan High Court. Justice Pradeep Nandrajog was enrolled as an Advocate with the Bar Council of Delhi in the year 1981. He was elevated as an Additional Judge of the Delhi High Court on 20th December 2002 and became a Permanent Judge on 16th April 2004.